When it comes to selecting where to make the focal point in your image, the world is your oyster. There are so many options, right? Yes and no. I find with landscapes, street photography, portraits and people there are a variety of options for focal points that you can choose to enhance your story. Focus then becomes a composition technique in such niches. For food, however, I feel our options are more limited when it comes to editorial and advertising shots. When images of food are used to sell a product, lifestyle or story, the food certainly is the hero. Composition, styling and post-production are all there to enhance the food subject, making it the hero. The viewer should be able to instantly connect with the story of making this recipe, buying this ingredient to savour with their family. Therefore the focal point that we choose in their frame should complement this notion. So what are the best places in your image for your focal points? Let’s explore some of the best places to focus on in your image. NOTE: these suggestions are just ‘guides’ and shouldn’t be strictly followed over creative exploration. You’ll want to include these in your shoot, but don’t limit yourself. Go beyond, capture everything, it may just lead you to something special. Before we jump into scoping out the best place in your image for your focal point, there are a few factors that will influence where in the frame we will want to use. Bokeh/Blur – depending on the look you are after and any bokeh, being the way your lens renders the out-of-focus points of light, or background blur in conjunction with the aperture you shoot. Angle – different angles that you shoot will present heights and sizes of your subjects differently, and could require different focal points. To explore some of the focal points you’ll want to include in your shooting process, let’s take a look at these in terms of the angle that you’ll shoot. Food subjects that are most complemented by a straight-on angle are subjects that have layers or height. This will play a role in where in your image you choose your focal point. If you’re after a blurry background and are shooting on a large aperture, you’ll want to focus on the your subjects in the foreground – middleground. Depending on the aperture that you’ve selected and where you choose your focus, you’ll need to keep in mind how your subjects in the background are appearing. If they are too blurry due to shallow depth of field, then you’ll want to either move them closer to the middle/foreground, choose a smaller aperture where possible or adjust your focal point slightly to be closer to the subjects that are blurry. 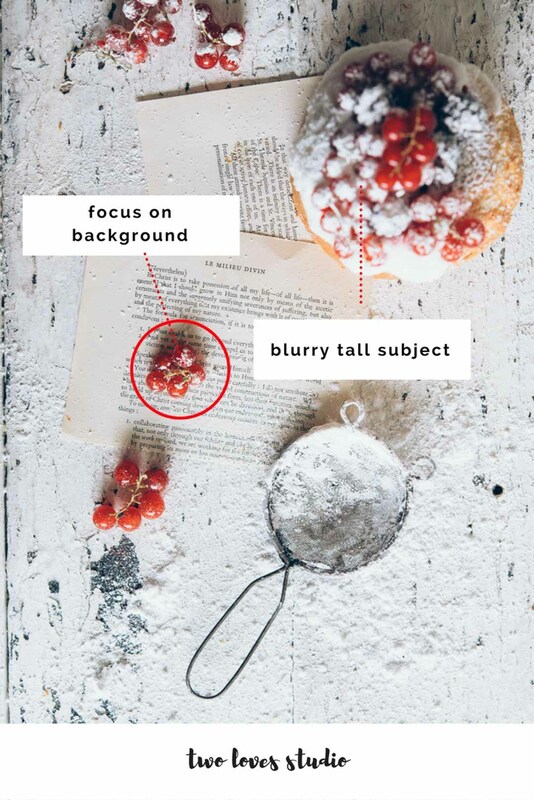 Overhead shots and flatlays can be used to shoot multiple types of subjects, but are best suited to showcase flatter food subjects, like pizzas and tarts. 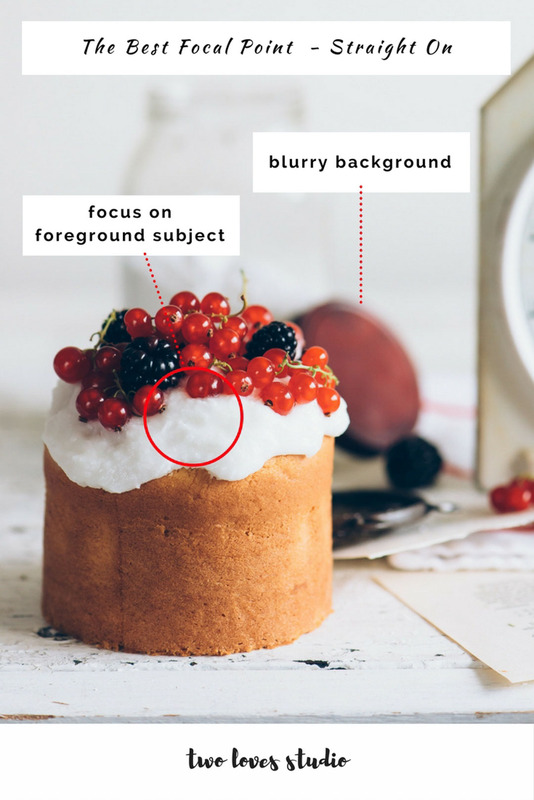 If you want the majority of your image to be in focus, including the hero food subject, then you’ll want to focus on your subject and ensure the surrounding subjects are of similar height. 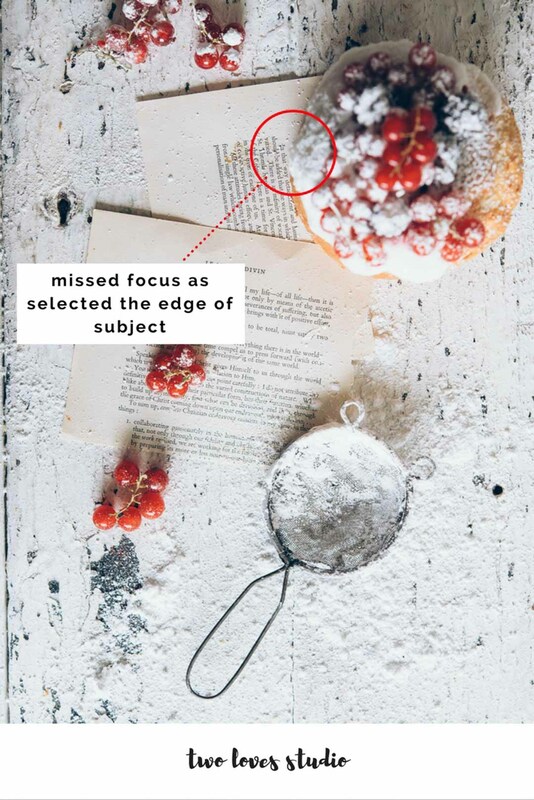 Usually with an overhead shot, your focal point will be on your food subject. Ideally in the middle of your subject. Depending on what aperture you’re shooting on, your surrounding subjects could be out of focus with a shallow depth of field. This will depend on their heights. 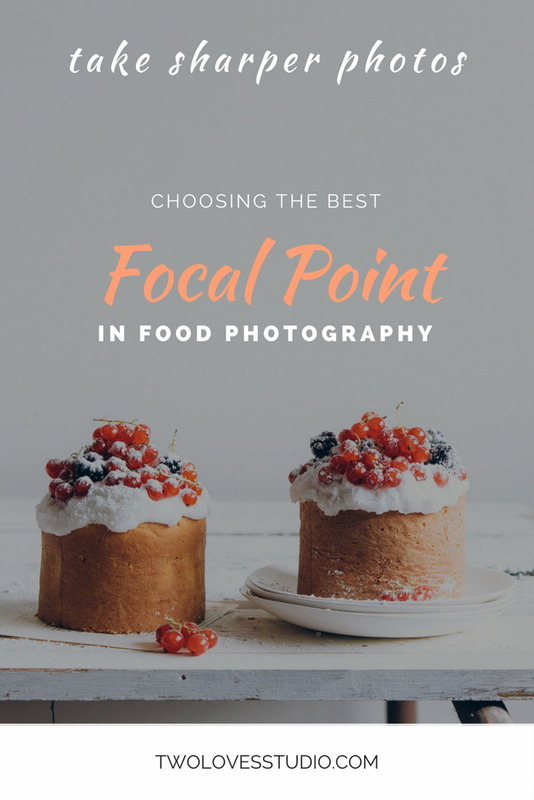 If you have a lot of varying heights of props and food, you’ll need to consider the subsequent plane of focus that comes with your chosen aperture. If you’re after the majority of your image to be in focus, it’s best to shoot on a smaller aperture. f/4.5 or f/5.6 is a good place to start. Using props that are of complementary heights will assist with any focal plane. 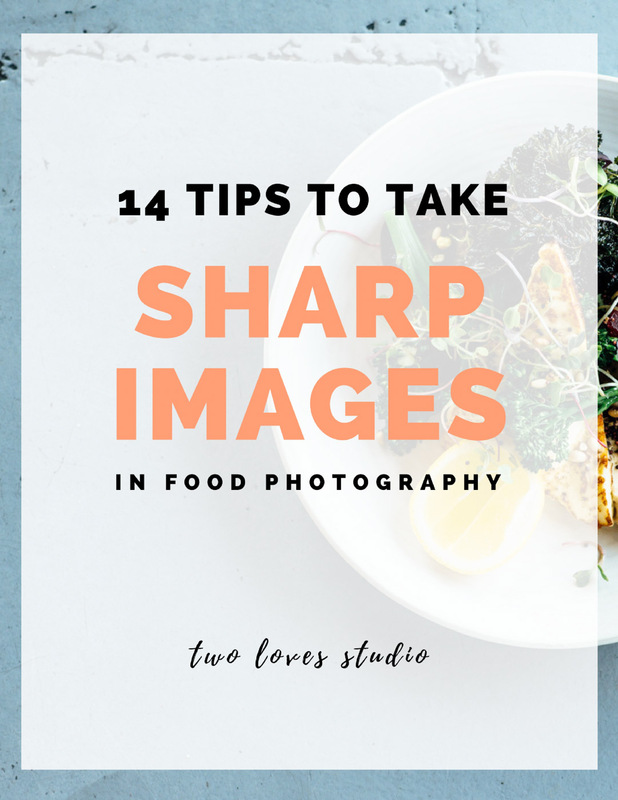 The angled shots, like 45 degrees and surrounding angles are best for capturing layers where you also need to include any details on the top of your food subject. This is similar to the straight on focus, expect that your plane of focus will change slightly to ensure you’re capturing the top of your food subject. If you’re shooting on a large aperture, you’ll want to be aware of how the other subjects or props are appearing that mightn’t be within the plane of focus. If it’s important to capture details of the top of multiple subjects, you may want to consider changing your focal point to be in the middle of foreground/middleground, restyle subjects to be closer to the plane of focus or shot a smaller aperture. There are many factors that we have to take into consideration when ensuring that we have sharp, in focus shots. Plus, there are different ways of setting up your camera to tackle focus modes and area modes. RELATED: ﻿Is Autofocus in Still Life Photography Bad? 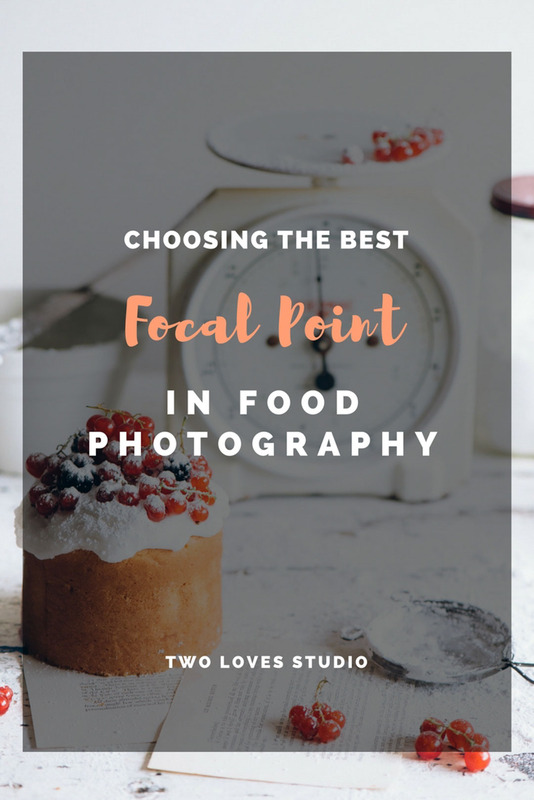 I want to leave you with two things to think about when it comes to choosing a focal point to focus on within your images. Should The Background Be Blurry/ Shallow Focus? One thing that really draws us to photography and to using a DSLR is the beautiful out of focus backgrounds and bokehs that can be achieved. But should a background always be out of focus? The short answer is it depends on the look and concept that you’re going after. However, whilst totally true, I tend to think about what angle I am shooting at as to whether it makes sense to blur out the background. Overhead: when it comes to overhead shots, I tend to think that the background should be more in focus than blurry or super shallow. This rings especially true for flatlays. Not to say that you need to shot at f/11, but shooting at f/4.5 or f/5.6 will allow the background to be enough in focus that it matches the rest of the scene. 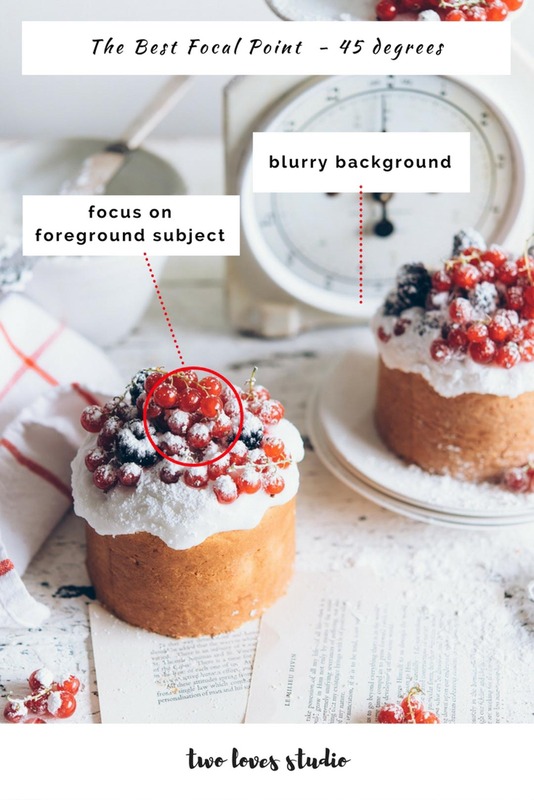 Therefore, choosing your focal point in your flatlay to ensure that the scene is well in focus and has depth of field will want to consider the foreground and background. Choosing a focal point in the middle ground so the foreground and background are similar in depth of field. 45 degree: angles are the best angles to showcase a shallow depth of field, blurring out the background. 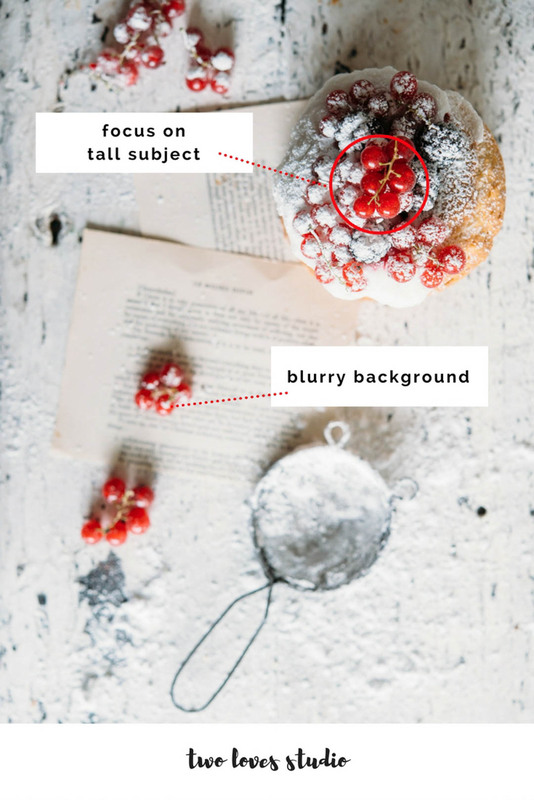 Typically your focus should fall in the foreground for food photography and ideally in the first lower part of the image. Because, in my opinion, food photography is more about ‘real’ situations than abstract, the hero subject is usually placed in the foreground to middle ground with supporting subjects in the background. Blurring the foreground and choosing a focal point in the background is something that many other niches of photography will use as a composition technique, but it tends not to convey a strong message. It’s more ideal to choose a focal point in the foreground and middleground, and blur the background than blurry the foreground at these angles. If you’re using autofocus and single point focus, you’ll want to be careful where in the frame you select with the single focus point. Ideally, you should be selecting the point to focus on so the point is entirely on your subject. This will ensure that the focus remains in that position in the frame. It can be a little sticky when you select the point to cover the edge of a subject, so half of the point is aiming in the middleground for example and the other half is aiming on the background. This can result in missed focus, so be sure that the entire point is on your chosen subject or use manual focus if it’s an issue. How do you choose your focal points in your images? Do you have a black and white rule, or do you decide based on the story you’re trying to tell?